Did you love audio soundtrack of a Youtube video or any other online video? You can easily extract and save Mp3 part from a video and listen it like a usual mp3 song. To get started, you need to download online video on the computer (online videos are downloaded in FLV format). 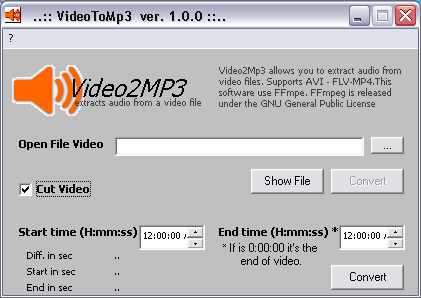 Then use VideoTomp3 utility to extract and convert video into mp3 format. 1. Download VideoToMp3 converter program. 2. Install it and then launch the program. 3. Load the video file in the application window. 4. Click Convert button for video to mp3 conversion. You can check “Cut Video” option to extract mp3 audio from only selected part of the video. Using this utility you can grab audio part from AVI, FLV, MP4 videos and save as Mp3. Alternatively, use AoA Audio Extractor for video to mp3 conversion.